About the VIII century b.C. a group of neolithic families belonging to the Osci began to take up their dwelling at a point not far from the coast of the Tyrrhenean Sea. They built a village on a small hill of prehistoric lava by the mouth of the River Sarno, then navigable, and on the slope of Mt. Vesuvius, an inactive volcano. Later Greek mariners came to establish a trading post near their village and created a civilised community into which the natives were absorbed. They called the place from the Greek word pompeioi meaning traders or merchants. 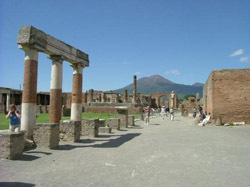 In the course of time Pompeii grew and became the port for all the towns in the hinterland. In the struggle between Etruscans and Greeks for the control of the seas, it fell first to one side and then to the other. From 600 to 530 b.C. it was under the sovereignity the Greeks of Cumai who built there the Doric temple of Hercules and introduced the worship of Apollo. Then the Etruscans took over until 474 b.C. and built a new wall of defence. This period came to an end with the invasion of Italic tribes called Samnites who occupied the town and all the surrounding country, to which they gave the name of Campania. The time came when Pompeii lost its independence and became part of the expanding Roman Empire. This happened with the outbreak of the Social War when Pompeii joined the confederation against Rome in the demand for equal rights as Roman citizens. In the spring of 89 b.C. the Romans legions laid siege to the town which was stubbornly defended. It was not till nine years later that it opened its gates to the victorious Romans and became a Roman colony with the official title of Colonia Veneria Cornelia Pompeii and with Latin as the official language. Roman magnificence was shown in the public works and buildings. Most of the streets were paved with stone from Vesuvius and the water supply was revolutionised by the Augustan aqueduct of serino. In the civil forum the old portico was replaced by the new one in travertine stone from Caserta and the square completely paved; it acquired a new nobility and grandeur and was reserved for use only on solemn occasions. With its 25,000 inhabitants the town was going about its usual busy life when on the 5th February in the year 62 or 63 a.D. a violent earthquake, a warning sign of the awakening of Vesuvius, shook it at its foundations and almost entirely destroyed it. The citizens set about repairing the damage with a good will, but then shortly after midday on the 24th August 79 a black cloud in the shape of a tall pine arose from the summit of the mountain and the town was plunged into the darkness of night under a hail of lapilli and ashes with streams of seething water. On the third day the sun shone out over a ruined town buried under a layer of lava six or seven yards deep. The actual number of victims will never be known; those found during the excavations amount to two thousand. No attempt was made after the catastrophe to repopulate the town and for all intents and purposes it disappeared from the map. Subsequent volcanic eruptions, the spread of malaria in the district, and especially the continual raids of Saracen pirates along the coast during the Middle Ages made the place a wilderness and a danger spot shunned by man. An architect, Domenico Fontana, while working on a hydraulic scheme between 1594 and 1600, cut through the fields on the site of the amphitheatre without the least awareness of the nature of the archaeologial finds. It was not untill 1748 that under Charles of Bourbon official excavations were undertaken after the position of Pompeii had been indicated from some inscriptions. When Italy became a united country the work took a scientific turn and eventually led to the discovery of the three fifth of the town as we see today.